Chinese President Xi Jinping, left, and Kyrgyz President Almazbek Atambayev shake hands in Bishkek, Kyrgyzstan on Wednesday, Sept. 11, 2013. Sapar Isakov stands accused of lobbying for the interests of the Chinese company that modernized the Bishkek power plant. Authorities in Kyrgyzstan have filed corruption charges against former Prime Minister Sapar Isakov stemming from the January breakdown of the Bishkek Heating and Power Plant. The plant’s failure during the bitter Kyrgyz winter has dovetailed with a spring chill in relations between former Kyrgyz President Almazbek Atambayev and his successor President Sooronbay Jeenbekov. As tensions rose between the two — exemplified in the steady firing of Atambayev’s allies — investigations into the power plant fiasco uncovered evidence of what critics call corruption in the plant’s recently completed modernization by a Chinese company. The State Committee for National Security (SCNS, GKNB, or UKMK) charges accuse Isakov of lobbying for the interests of Tebian Electric Apparatus Stock Co. Ltd. (TBEA), the Chinese company awarded the contract in 2013 to modernize the 1960s-era plant. At the time Isakov was deputy head of the presidential administration and spearheading work on foreign investments. As I outline in an article in the upcoming issue of The Diplomat Magazine, early outrage after the power plant failure in January focused on the fact that there had been no tender process to select the company that would executed the project supported by a $386 million loan from China’s Eximbank issued in the open days of what we now call the Belt and Road Initiative. A good tendering process — in which the government solicits proposals (bids) from companies to complete a specific project — can be a key part of preventing corruption in development projects like the modernization of the Bishkek power plant. While there are also corruption risks in the tendering process, in general a well-run tendering process helps keep prices reasonable, ensure that competent companies win contracts and insulate the selection from political factors. There are reasons some projects don’t have a tender, usually because there is only one option in a market or because of time demands, but in this case the lack of a tender appears to be part of the loan agreement with China or a more fluid understanding between Bishkek and Beijing. A 2014 24.kg article quoted Salaydin Avazov, then-director general of Electrical Stations, the state-owned company that manages Kyrgyzstan’s power-generating facilities, as saying that a tender was impossible. “If we had money for reconstruction, we would have held a tender. And since there is no money, we have agreed to the terms of Eximbank,” he said. In short: China demanded a specific company be granted the project and Kyrgyzstan agreed, usual procurement processes be damned. Isakov isn’t the first to face criminal charges stemming from the power plant problem. In April, Avazov — who had since become mayor of Jalal-Abad — was detained by the SCNS in connection to the ongoing investigation into the power plant breakdown. Then, on May 21, he SCNS filed corruption charges against Kubanychbek Kulmatov, the recently fired head of the customs service in relation to the redirecting of $2 million in Chinese grants — given as part of the overall 2013 financial aid package. 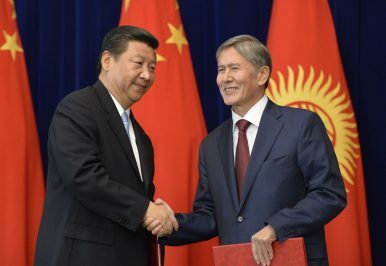 This saga is far from over and raises a host of questions and concerns about not only the role of domestic politicking between Jeenbekov and his predecessor in the hunt to eliminate corruption to the larger geopolitical question of how a small country like Kyrgyzstan can resist demands (and dangled funding) from China. In 2018, both the Bishkek power plant and the Atambayev-Jeenbekov relationship began malfunctioning.